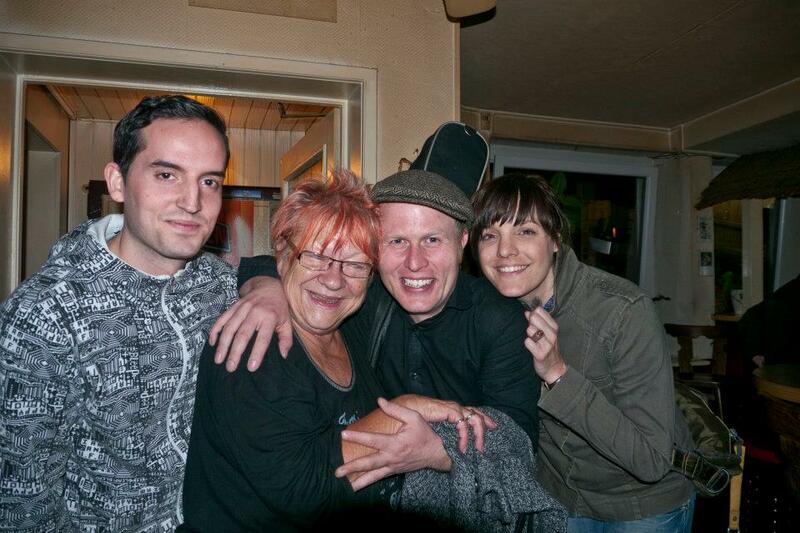 As I write this my friends in Freiburg, Germany are gathering to remember the woman we called Gundi. I only vaguely remember the first time I met Hildegund Dörflinger, because I was already wobbly on Christmas-market Glühwein when I arrived at her bar. But I do remember that she made me feel instantly welcome. But Gundi and I exchanged a couple of letters and the following spring I was back in Freiburg. My friends were eager for some bar-hopping, but I was tired after a long day of travel. So I set off for home alone and immediately got lost. 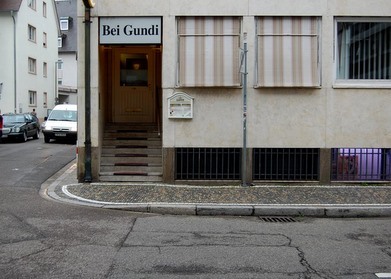 The streets were dark and the signs were hard to read, but by some act of grace I stumbled into Gundi’s place. I was so relieved when our eyes met that I burst into tears. She hugged me, brought me soup and called me a taxi. I saw Gundi again the following evening, when my friends and I gathered for a small concert. “Hallo, Heide. Alles OK?” she asked me. She smiled broadly when I nodded. I loved her fuchsia-and-orange hair and her twinkling little eyes. But more than anything I remember her smile. She always seemed so full of good cheer, even when it was way past closing … and no one was going home. Gundi brought people together. She was like family to her regulars, and she fed more than a few starving musicians. 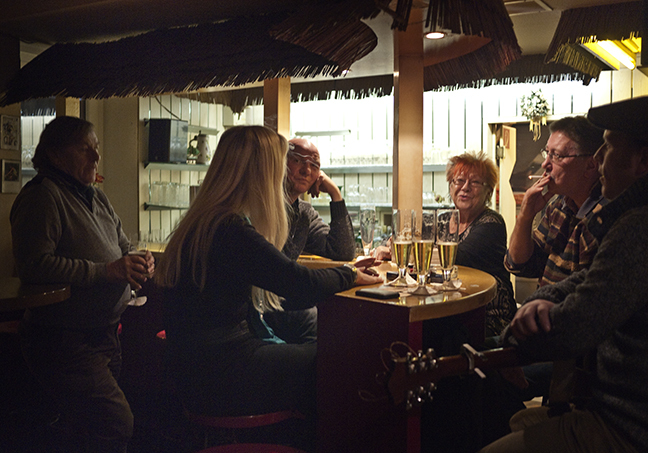 I heard some fantastic music at Bei Gundi, in fact — especially late at night, long after the “official” show had ended. Not everyone loved the music and loud gatherings, though. Shortly after my second trip I heard that some of Gundi’s neighbors had complained, and she’d lost her lease. Two months later Bei Gundi was out of business. I thought of Gundi often after that, and wondered how she was doing. I also thought of looking her up the last time I was in Freiburg. I wasn’t in the mood for the old party crowd, though, so I resolved to see Gundi next time. All that’s left now of Gundi is my friends’ and my happy memories. But through those memories, Gundi lives on: Her legacy is the friendships she nurtured, the musicians she helped support, and the people she brought together. Du hast uns alle in dein großes Herz geschlossen und wirst mir immer in Gedanken bleiben. Auf dich meine liebe und großartige Gundi ruhe in frieden. Rest in peace, dear Gundi. Rest in peace. I’m sorry for your loss, Hedder. It sounds like she was a dear woman. I am sorry for your loss and happy for the friendship you had. Thank you, Tom! She didn’t speak much English and I had even less German, but it didn’t seem to matter. We could say everything we needed to with smiles and gestures. Sorry to hear about your loss and Gundi sounds like a lovely woman who touched and brought joy to those around her. Thank you for your sweet words about Gundi, Angelina. Very kind of you. Although you’re sad, the joy she brought to you comes through clearly. You were indeed lucky to know her. Beautifully said, Paula. Thank you.